1WineDude has an outstanding blog today headlined “Useless California Vintage Reports: a Template” (see link to the left). It brings up a topic I’ve been saving for a special rant – I mean discussion. Which is, why rate vintages at all? The Dude’s point, well taken, is that the standard vintage overview provided by winery PR folks is so predictable that apart from being lampooned it’s completely useless. I’d go a step farther and say that the same basically applies across the board. Though many old school critics, newsletter writers and consumer publications insist on doing vintage ratings, I don’t think that they have the meaning or importance that they once did. Back in the day, when wine consumers were mostly focused on Bordeaux, Burgundy, select parts of Germany and Port country, vintage variation was quite real and important. Vineyards were managed differently, the New World wines were considered to be second or third rate, and wines were made to be cellared (in good vintages) or consumed early (in “useful” vintages). All that has changed. Even in Ye Olde Worlde these days, changing weather patterns and significant advances in vineyard design and management have minimized vintage variation. On top of that, the way wine is made has also evolved, and all but the most extreme vintages can be turned into good wine. Oddly enough, in Europe, extreme heat (such as 2003) does not necessarily translate into poor ratings for the vintage. Here in Washington, a truly great vintage – 1999 – was lambasted by most reviewers and publications (too cool they said) while the too warm, too ripe wines of 1998 were called extraordinary. The main point is that a great producer makes outstanding wine in every vintage, or does not put his/her name on the label. Making generic pronouncements via vintage charts covering vast regions (the Columbia Valley), or even smaller AVAs (Red Mountain) is rarely helpful when there is such variation among the individual vineyard sites. The age of the vines, the type of spacing and trellising, the clonal selection, the irrigation program, and overall vineyard management decisions will have much more to do with the quality of the harvest. What vintage variation there is will best be captured in the bottle, not in a generic rating. The debate about rating wines rages on, but at least with a wine rating you know what is being talked about. With a vintage rating, who can tell? Despite climate changes and growing techniques intended to reduce annual variation in fruit character, there is still vintage variation in wines. It may be more subtle in some cases and what's true for Walla Walla one year is not necessarily applicable to Santa Barbara County or the Sierra Foothills. Oh, and your example of the 1998/1999 disparity is the 800-pound gorilla in the room: critics are no thinking about the wines they review. They are not considering what the sensory characteristics mean for the wine *BEYOND* the immediate appeal on the first four pours out of a bottle which may not have yet been put to market. Not exactly sure what you're getting at Arthur. I never said there was no vintage variation - just that it should be captured in a bottle, not in a bogus rating. And since I am a critic, I can assure you that I am always thinking about the wines I review, in every possible frame of reference, including but certainly not in any way limited to "immediate appeal." That was not meant as a wide aspersion at you. From reading your stuff, I get a sense that we're probably aligned on this issue. What I meant in the second comment is that the better vintage (long term) probably had less immediate appeal as compared to the vintage which got higher scores. All this points to the fact that most critics just don't think about the stuff they are tasting beyond "how tasty is this/how much do I like it". Enjoyment is but one facet of a wine. I was trying to be succinct, but I did get your meaning about variation. I think too often, too big of a blanket is applied to vintages. And, yes, every year IS a vintage year when you have a surplus of however many tons or thousands of gallons. Paul, here here. I was indoctrinated into this business by a buyer who believed in particular producers (not vintages) and relied on those tried-and-true winemakers to consistently turn in quality wine. I've since tried to steer customers into more reliable producers than paying much attention to vintage, especially now when as you said, winemaking techniques are greatly improved and vintage variation is not really a factor anymore. Thanks for the mention, and for the great post. I've long thought that vintage variations are made out to be much larger of a deal than they should be. And I have some first-hand experience on this when it comes to CA. 1998 was declared a poor vintage in general for CA and particularly for Napa. The result was that some wines were discounted a bit, in terms of seeming to me to be undervalued. So, I bought I think 3 bottles of Opus One in 1998, and I tasted them at different intervals opening the bottles several years apart. The first was opened quite early, and it was a tough wine, and I could understand why some folks might think it might never have harmonized. I opened the 3rd bottle several years later, and it was screaming good, and extremely vibrant and fruity, with some very interesting secondary aromas of pencil lead, spices, etc. It blew away a group of very geeky wine folks (pros, sommeliers, wine directors, writers) at a gathering where we were opening several bottles from all over the world (different vintages as well). The lesson for me was, when someone declares a crap vintage in Napa, start buying. A message to Washington wineries…..be very thankful you don’t have substantial rains during harvest and that your fruit is grown in a desert climate. The number one difference between a good vintage and mediocre vintage in Old World wine regions is water availability or rain. It’s not that big of secret. I do agree that reviewing and judging vintages is beneficial for the consumer. Example: 2002 Southern Rhones. Has anyone enjoyed a bottle lately? 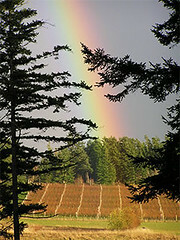 Paul, love your blog and the work you do for Washington wines. With modern irrigation mechanisms in what would otherwise be an area too dry for ideal grapegrowing, vintage variation can be minimized. In a dry-farmed area such as the great French regions, vintage variation still has meaning. Vintage variations do exist, but good winemakers will always produce good wine no matter the vintage. 2007 Oregon was at best a challanging vintage, but J Chrisopher, Ken Wright, Eyrie... made really good wines. I liked the term "useful" vintage. It desribes the off vintage perfectly. these are wines that are meant to drink while we wait for the better vintages to come around. Great topic. I have a winery on the west coast of NY and our vintages vary greatly year to year. In 2007 we had no rain - May to September and little in the fall. In 2009 it rained 3-4 times per week June-September. Different varieties tend to do better in one type of year vs. another. It is a challenge to get the best in any given year, but that is what makes this wine region so much fun to work in. Paul, I found it especially ironic that on the day I read your “rant” on vintages and how they don’t mean much today, I picked up the latest issue of Wine Enthusiast and what did I see but your latest vintage ratings. And on your blog Monday you said “As the most-anticipated red wines from 2007 hit the shelves, I find myself agreeing. 2007 is going to be counted among a handful of truly great Washington vintages.” I agree with your conclusion, because it’s the same one we made many months ago, but why would you make such a statement after your “rant” against the importance of vintages? John, yes, I do see the irony - unintended but certainly apparent. The Wine Enthusiast, for whom I contribute, asks me to do vintage ratings and pays me for it. I do it as best I can. My blog - unfined and unfiltered - is also unedited (except by me), and unpaid for. So here is where I give myself total freedom to opine and sometimes rant. It's my gift to me. My point was not that there aren't important differences among vintages - of course there are - but rather that assigning ratings (eg numbers) to vintages makes far less sense (to me) than assigning ratings (eg 100 point scale) to individual wines. A recitation of the obvious and legitimate factors that go into making a beautiful wine does not amount to a logical argument that vintage doesn't matter. I can't think of a single winemaker who would lay claim to being able to make equally successful wines regardless of vintage. Not even in California. One could argue that numerical scores do not capture the essential information which consumers and collectors should use to make informed decisions (duh) but neither do bottle scores. I will leave this earth regretting not purchasing more wines from great vintages. For me, less is lost in missing the best wines from less successful vintages. Suggestions for improvement in the reporting of vintage potential is valuable. Dismissing or minimizing the importance of mother nature and her fickle ways seems wrong-headed and just doesn't square with my experience. Vintage still matters and I think it always will. BTW. In 2008 a very high percentage of the wine I have tasted from Willamette Valley tastes outstandingly good. This can be best explained not so much by all methods and sciences but by the fabulous weather. I'll give it a 9. Late breaking comment, Anon, but the real question is who defines a "great" vintage? And when? And how is it great? My great vintage for WA is 1999 - look at the reviews of those wines and it is universally decried as a "poor" year. If you go out and buy up the "great vintages" you often get burned, as happened with the '97 Brunellos and many of the '96 grand cru Chablis I purchased, to cite just two examples.